Day 6: Now, visiting the great Southwest and enjoying the sights and sounds of the Grand Canyon, Hoover Dam and Las Vegas were great, but really this trip started out with Mickey Mouse in mind. So today was the big day, our last long drive and first day at Disneyland! We slept in (we were in Vegas after all), packed up and hit the road about 10 am. We arrived in Anaheim around 2 pm. Following our usual routine we checked into the hotel (this time the Howard Johnson “HoJo” on Harbor Boulevard), dropped off our suitcases, packed a park bag (a backpack full of items that are helpful at the theme park) and off we went to the park within 30 minutes of arriving. It was a really easy walk, less than 10 minutes if you are a fast walker, maybe closer to 15 with little kids in tow. Disneyland was a new experience for me. I haven’t been there since I was in 6th grade. I have, however, been to Disney World several times in the last few years. Disneyland and Disney World are different. I mean really different. The first difference is that when you are walking along Harbor Boulevard toward the parks you are definitely not in the Disney bubble. It is a regular city atmosphere with bus stops, an occasional panhandler and people just living regular life. At Disney World (especially if you arrive via plane and take Magical Express) you are completely sheltered from anything non-Disney. 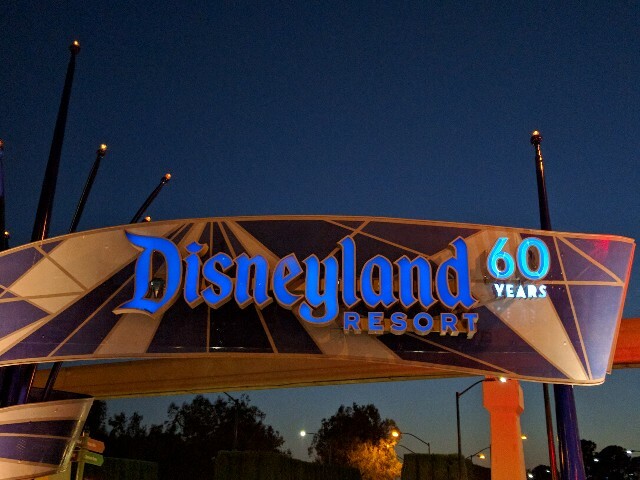 Once you have walked about a quarter mile from the HoJo it is time to cross Harbor Boulevard and walk under the Disneyland sign. From here it is a just a little further until you reach security and the park entrances. Disneyland and Disney California Adventure are across a plaza from each other. Like so close it is shocking to those who are used to Disney World. 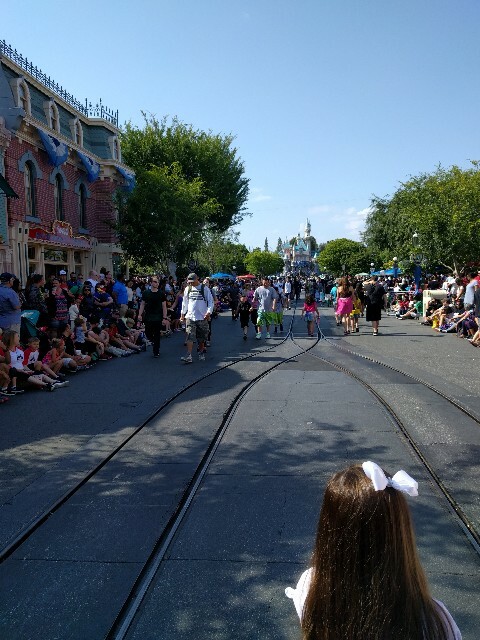 Now I see why people really encouraged getting a park hopper (a ticket option that allows entrance to more than one park per day). The next big difference was when we walked through the entrance turnstiles. Who was waiting right there? Snow White and Belle! And with very little line! So within 15 minutes we’ve already met two princesses, and I still haven’t even grabbed a map yet. For those of you who are avid Disney World people, be prepared for Sleeping Beauty’s castle. It is beautiful and detailed, but is a lot smaller than Cinderella’s. It just doesn’t have the huge presence of Cinderella’s. The overall footprint of Disneyland is 85 acres versus 107 acres at Magic Kingdom, and you certainly feel the difference. But Disneyland has an amazing charm all of its own if you give it a chance. 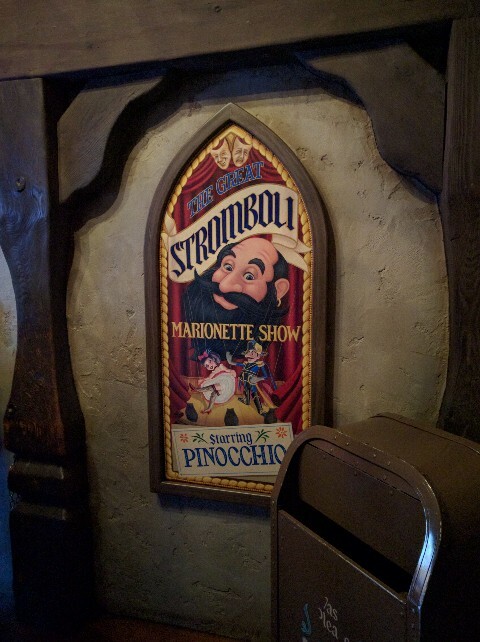 We started off toward Adventureland. 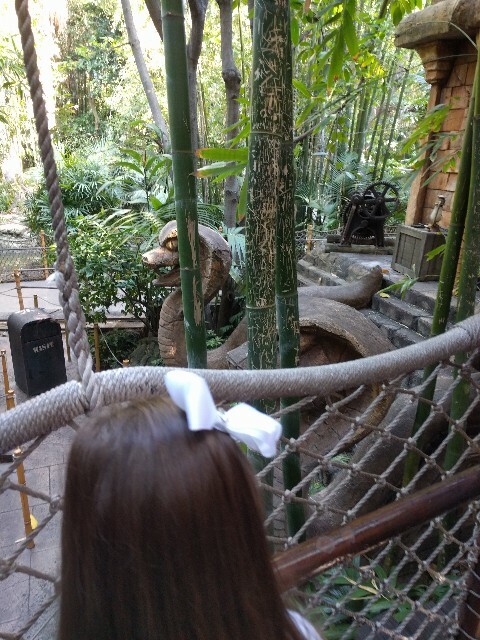 The wait for Jungle Cruise was pretty short so we hopped on that classic first. We had initially wanted to go on Indiana Jones Adventure, but it was closed briefly for a repair. We enjoyed our cruise captain’s terrible jokes, the sights and sounds of the jungle and exited the attraction. Just as we were walking past Indiana Jones to grab something to eat a cast member opened the chain for the line – Indiana Jones Adventure was up and running! This is a ride that generally has a higher wait time (it is not unusual for the wait to be 40 minutes or more), but we walked right through the line and got into a vehicle within a few minutes. The ride simulated a bumpy trip through the movies complete with avoiding some of the pitfalls Indiana Jones himself encountered. My mom and I loved it. Elizabeth, not so much. She is more of a roller coaster than a dark ride kid. By now we were starving, because we had skipped lunch and only had snacks on the drive. 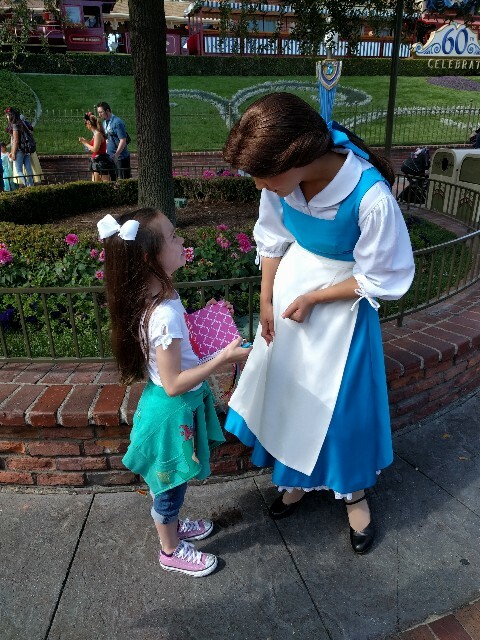 I always preview menus for quick service places at the parks so that I know which places have things that should be safe for Elizabeth’s food allergy (see my guide to dealing with food allergies at the parks) and still delicious. A very short walk from Indiana Jones brought us to French Market restaurant where Elizabeth ate her fill of chicken and rice and we ladies had beef stew in a bread bowl. Yum! Next up: Pirates of the Caribbean. This is one of those rides that is present at both Disneyland and Disney World, but I have to admit the one at Disneyland is way more amazing. The ride is longer, more detailed and just a lot more fun in my (and rest of my party’s) opinion. Which is saying a lot since we love the one at Disney World. A quick walk brought us to the Haunted Mansion. Again, present at both parks, but this time pretty similar in experience. 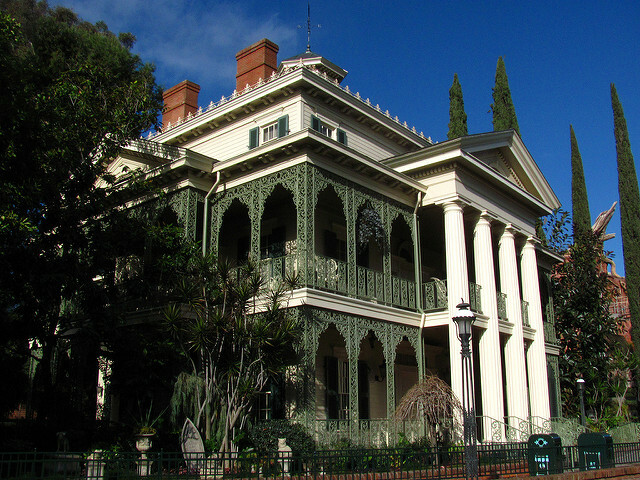 The waiting queue in Walt Disney World is more interactive fun (it was recently updated in 2011), but Disneyland decks out the Haunted Mansion for the holidays so let’s call that one a tie. Although our dinner was delicious, we were looking for a treat. I had read a post from Casey at Disneyland Daily about “off the menu” items at Disneyland. We went in search of the ice cream nachos at Golden Horseshoe Saloon. I checked with staff that the ice cream was corn-free (it was!) and we got this plate full of broken waffle cones, ice cream and hot fudge. It was ridiculous, in a good way. And only $5.99. The three of us couldn’t finish it all. By this time it was getting late, and Elizabeth hadn’t found her perfect set of ears yet. Much like Goldilocks nothing seemed quite right for her. 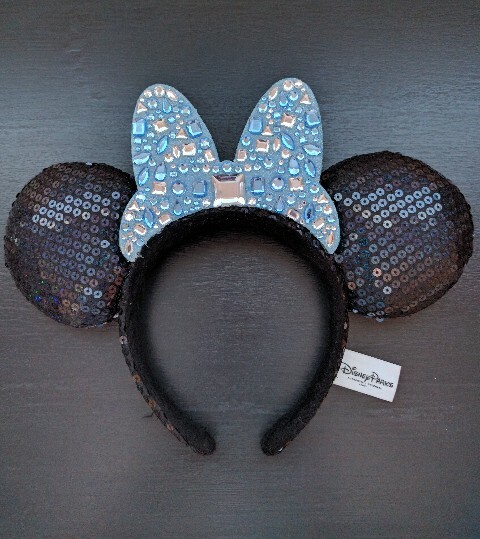 Then she saw them….the bedazzled Diamond Celebration ears. They really are beauties. and then went to Mad Tea Party (or as many know it, “the tea cups”). This was again one that Disneyland wins in the showdown. 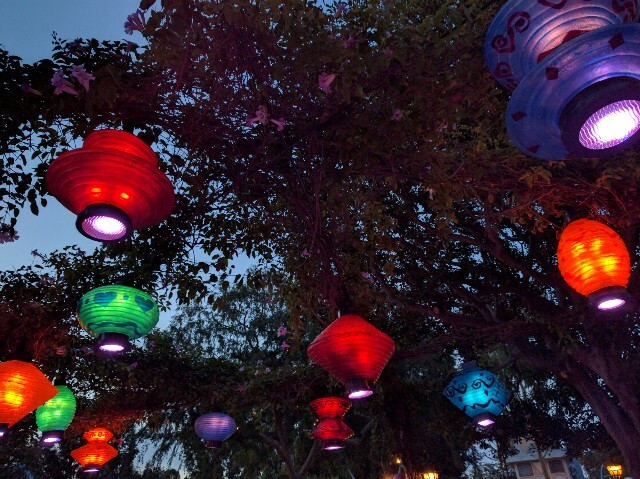 We absolutely loved the open air with trees and lanterns over the ride at Disneyland versus the roofed version at Disney World. How could you not love to look at this?! I think it was a pretty successful day considering we got to the parks a little before 3 pm. Time to head back to the hotel and rest up for our first full day at the park! 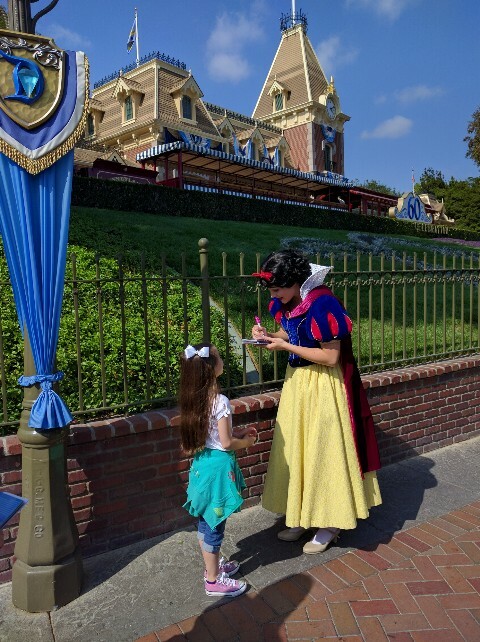 Are you planning a trip to Disneyland in California? I have helpful articles for you! 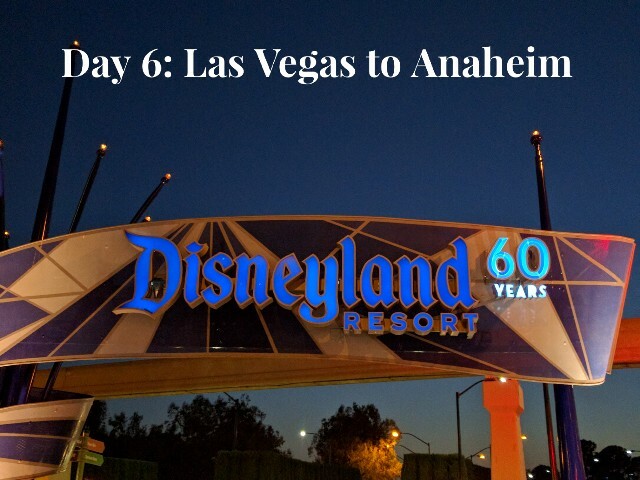 Previous Post:Road Trip to Disneyland: Vegas! 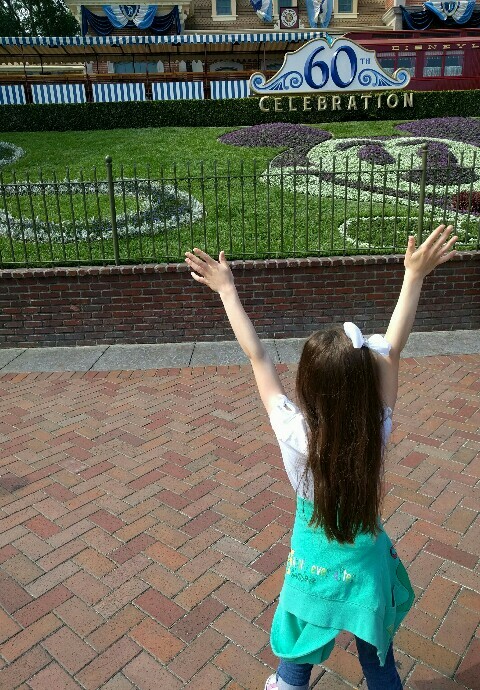 Next Post:Road Trip to Disneyland: Pan, Tink and Hook, Oh My!